Traveling to Dak Lak by this time, you are drifting into the atmosphere of the festival as well as the smell of the white coffee flowers. Dak Lak divided into two distinct rainy and dry seasons. The dry season starts from November to April of the following year. The rainy season starts from May to October. The climate is relatively mild, the average annual temperature of 23-24 degrees C.
In order to comprehend the Highlands, you should arrive at the two correct time. In particular, the December is when the blossoming yellow wild sunflowers paint the scene of the Highlands and the time for the local to hold festivals. 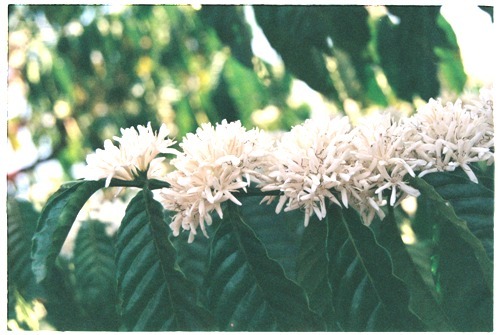 March is the season of coffee flowers to white the earth of the Highlands and fascinating elephant racing festival. Tourists can go to Dak Lak by car or motorcycle, bus or plane and you can be derived from Hanoi, Saigon and Da Nang. Bus: In Hanoi, you buy tickets at the Giap Bat bus station, for about 700,000 VND. In Saigon, travelers can start the journey from the Eastern bus station for about 220000-300000 VND. If derived from Danang, you can go to the Central Bus Station for tickets vary from 250000-350000 VND. Aircraft: You can buy tickets at many different locations with any given time. Destination is the Buon Me Thuot airport, from where you can easily catch a bus or taxi to the city center. Downtown of Dak Lak has many motels, hotels for tourists to choose from. However, prices are slightly higher here than in other areas. In particular, 500000-1 million VND ($25 to $50) for the price for guesthouses and 1.2 to 3 million VND ($55 to $125) for luxury hotels. You can find many places to stay on Ngo Quyen Street, Nguyen Duc Canh, Nguyen Cong Tru, Nguyen Chi Thanh Street … in the city of Buon Ma Thuot. In addition of enjoying the flavor of coffee, visitors should by these locations into their visiting map in order to save costs and be more perfect trip. Coffee Flower Forest: Coming to the Highlands, it is not difficult to find the vast forests of coffee, where the large area of the country is growing and is considered the “capital” of the plant. March is the time of the hills to be covered with white, creating poetic scenery, wonderful. Trung Nguyen Coffee Village: A place where you can enjoy coffee with many flavors and in different styles. Along with the special drinks, this place is considered a miniature museum detailed a Highland village. This is a good place to visit, enjoy a cup of coffee and study the museum artifacts before you see the real things. Tourist Center Don Village: Don Village (Bản Đôn) is an important landmark in the tourist map in the Highlands. Not only possessing the beautiful landscapes, from thick forest to the majestic river or herds of elephants , this place also has special dishes such as grilled chicken (gà sa lửa), Ama Kong wine. Yok Don National Park: An beautiful ecotourism attraction for many domestic and foreign tourists located in Krong Na commune, Buon Don district, 40 km from Buon Ma Thuot northwest. Tourists come here will enjoy so many fun activities such as elephant riding, hiking, mountain biking in the primeval forests. Especially at night, you can go see the wild animals, and in the daytime, you can kayak on the river of Sêrêpok. Also, when visiting the village, remember to enjoy the wine along with many cuisines of the Highlands. Lak Lake: about 56 km to the south of Buon Ma Thuot City is the largest freshwater lake in Central Highlands and the second largest in Vietnam (after Ba Be lake). The lake is covered with primeval forests. Coming to Lak Lake, visitors can not miss the fun of swinging on the back of the giant elephant when they cross the river. Next is traveling on canoes along the river. You can also bring rods to fish, turn them into dinner and enjoy the wine in the light of the fire of the plateau. Jun Village: On the brink of the poetic Lak Lake, Jun Village is the central point of the vivid picture of the Highland mountains. The traditional long house is located on the middle slopes, where the M’Nông girls is weaving. In front of the house, the baby elephant is playing where the tall ancient canopy embraced the place. Lak Lake and the vast forests of coffee surround the place. Here, visitors can search for the identity of the wild, mysterious and awfully peaceful Highland. The festival is the soul of red land. Coming here, you have to take part in the festival atmosphere of the Highlands. There are festivals organized at a certain time, some other based on climate and crop year. 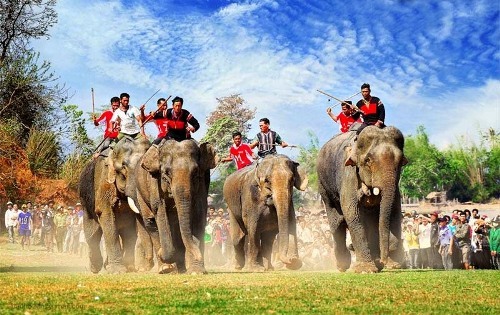 Elephant racing festival is held regularly twice a year, in March. But buffalo fight festival held from February to May. The wedding elephant, ivory cutting and health ritual offerings to the elephants, Bo Ma festival, offering water rituals, or the New Meal ceremony … attract visitors and still bore the original and mysteries of the Highlands. 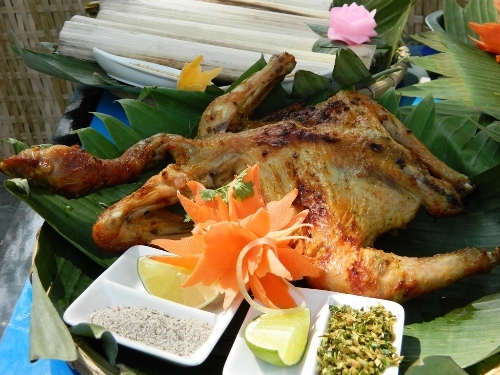 Rice with sesame, Don Village grilled chicken, Lak Lake strabismus, Sêrêpok hemibagrus, wild vegetables cooked in tube, elaeocarpus, salad leaves, wine, Ama Kong wine… are cuisines of the famous Highlands that should not be ignored. You should definitely try the delicious Ferret Coffee, wild honey, dried banana seeds to make liquor, dried infant bamboo, traditional brocade scarves … are the should-have gifts after visiting the Highlands. You must not litter when you are in the primeval forest, do not hurt the elephants, dressed polite in the village, and respect the local culture of the people.